Primary constraints=ulnohumeral articulation(coronoid), medial collateral ligament(MCL), lateral collateral ligament(LCL) (King GJ, JSES 2;165:1993). Secondary constraints=radial head, common flexor and extensor origins, capsule. (Morrey BF, CORR 1991;265:187). Dynamic constaints=mucles which cross the elbow, mainly the triceps, anconeus and brachialis. 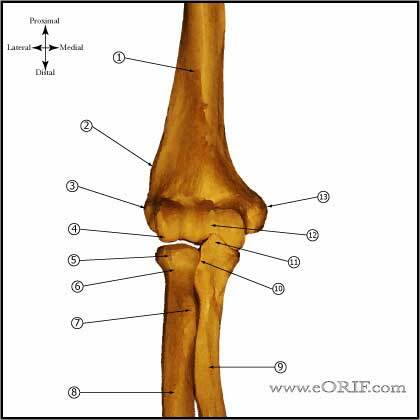 Anterior band of medial collateral ligament is the primary constraint to valgus instability. Pathoanatomy of dislocation is a circle of bone/soft tissue disruption starting laterally and progressing medially. 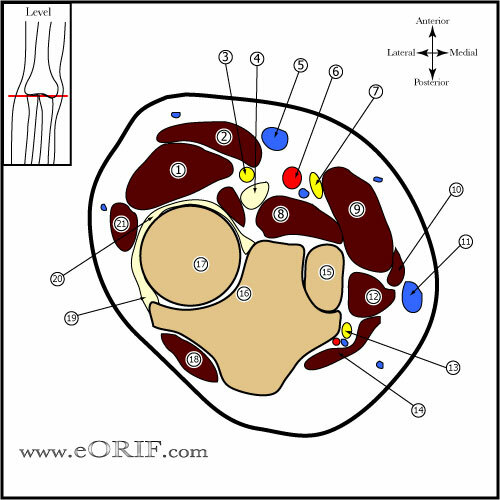 Stage I=ulnar band of LCL, Stage II=ant/post capsule, Stage III=MCL disrupted, anterior band of MCL is the last to disrupt. Most dislocations have disruptions of both the MCL and LCL. Generally present with obvious deformity, pain and swelling. Lateral pivot shift test=for posterolateral rotatory instability- pt supine, arm overhead. Supination-valgus moment applied during flexion, elbow subluxates usually at @40degrees, additional flexion causes reduction/clunk. Should create apprehension. Valgus and varus stress, both in extension and 30 degrees flexion. Valgus stress testing performed in full pronation to eliminated posterolateral rotatory instability. A/P and lateral elbow films demostrates dislocation and associated fractures. Consider CT scan if fracture fragment is not clearly seen on xray. 7-10 day post-operative: Splint removed, ROM in a hinged elbow brace is started with ROM determined by security of fixation achieved at surgery. See also Elbow Outcome Measures.